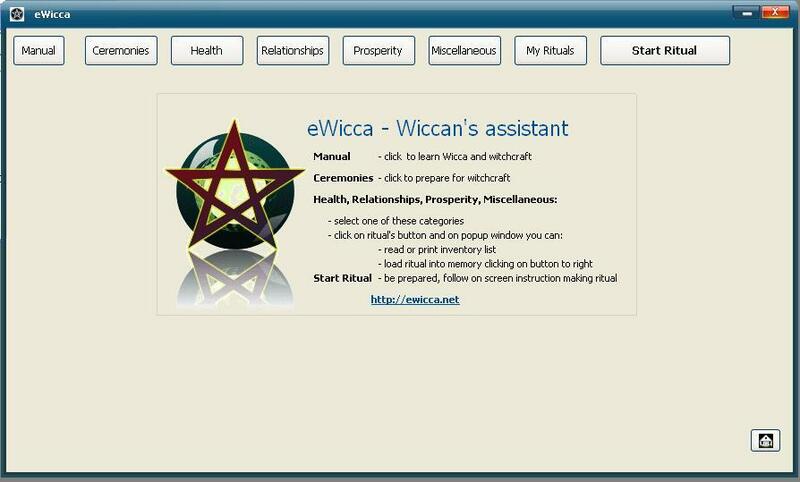 eWicca - software to learn wicca, witchcraft spells and rituals. Program does not cast spell for you, because this is absolutely useless. Rather You are the One who casts witchcraft spells and employs eWicca according to witchcraft traditions. Please read Disclaimer to avoid possible confusion. With eWicca even novice can learn and practice witchcraft as real and experienced witches do. Although studying craft from eWicca manual is assumed by default, there are no more hidden aspects or additional research areas in witchcraft, which you need to learn to perform built-in wiccan rituals, cast magick spells or practice meditation. or simply forget to include instructions on how to prepare for wiccan rituals, stimulating widespread belief that magick spells are charlatanry, because they failed. Forgetting to consider than wiccan ritual requires preparation, like any professional activity. wrong technique: just casting of "secret spell" and believing it would work. Occasionally it happens. eWicca provides step-by-step guidance before, during and after the ritual. Conforming to wicca principles and following built-in instructions ensure correctness of your magick ritual, even if you are just a novice witch. Special audio and visual stimulations (binaural beats, brainwaves stimulations, subliminal messages) to make ritual procedures as much effective as possible. I include words of power and customer name into eWicca source code to personalize program and ensure maximum effectiveness for your rituals. 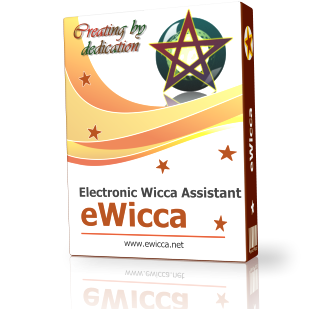 Unlike absolute majority witchcraft sources, eWicca contains complete wicca rituals with audio and visual stimulations, and explicit, real-time instructions on how and when to act. eWicca is not just software which contain witchcraft spells with listing of required ingredients and words to say. All Rituals conform to Wicca principles and incorporate such traditions as: Candle Magick, Sigil Magic, Knot Magick, Moon Magick, Charming, Words of Power, Voodoo, Druid Magick, Kabbalah, Shaman. Short, yet comprehensive Witchcraft guide will also be helpful for understanding principles of Wicca and creation of own rituals for witchcraft.